There may come a point where you need to test the edibility of a plant for survival purposes. You do not want to just start eating anything green that you come across, but you may also not have time to learn all of the local flora. 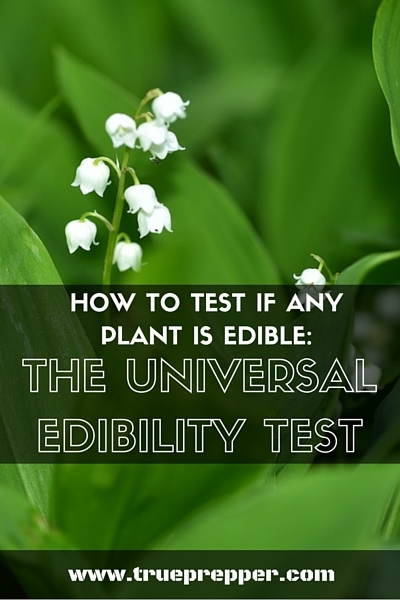 The universal edibility test is here to help, and guide you through a process to determine which plants, or even just parts of plants are safe to eat. While it may seem tedious and slow, doing each of these steps is important to stay safe while trying new plants. The main idea of the test is to expose yourself to the plant in a controlled manner and to see if any symptoms develop between exposure. This wilderness survival skill can come in handy not just in the wild, but in backyards as well given an emergency. You do not want to go through all of these steps if you can not apply it to an abundance of plants. The Universal Edibility Test is a thorough and lengthy process, and you do not want to waste time doing it if you do not have plenty of the plant you are testing. Pull the flowers, buds, leaves, stems, seeds, and roots apart and into separate piles. It is important to try each part of the plant separately, since some components could be toxic but others are edible. Rhubarb is one example where the stalks are edible but the leaves are toxic. Also check the plant to make sure it is in good shape, not rotting, and doesn’t have any insects in this step. Picking a part of the plant that is most plentiful will give you the best return on your time investment. If the plant has an unpleasant odor, do not eat that part of the plant. Strong or acidic smells should raise suspicion. Any scent that smells like almonds is best to avoid, since that is an indicator of a toxic compound. Touch a piece of the plant to your wrist for 15 minutes. If you experience an itching, burning, or numbness, do not eat that part of the plant. Wait eight hours until going to the next step to check for the development of rashes or any other reaction. Do not eat during this time. You can cook the pieces of the plant for this step, and prepare it like you would eat it. Cooking plants is preferred because some plants are toxic raw, but not when cooked. Once prepared, then touch the plant to your lips to test for itching, burning, or numbness. If you experience any of those in the next 3 minutes, do not eat that part of the plant. Pop a small portion of the plant in your mouth and place it on your tongue for 15 minutes. Chew the plant and then hold it in your mouth for 15 minutes without swallowing. If it tastes soapy or bitter, spit it out and do not eat that part of the plant. Swallow the plant. Wait eight hours for any adverse reactions, and if there are none, then prepare at least ¼ cup of that plant part and eat it. If you have no reaction after another 8 hours then that part of the plant is edible. You will want to repeat this entire process for all of the parts of the plant, since the entire plant could be edible, or just select parts. If you would prefer not to go through the steps and wait these periods to determine if a plant is edible, it may be a good idea to pick up an edible plant guide. It is important to note that these steps do not work for mushrooms or other types of fungus. If you want to determine what types of fungus are edible, a mushroom guide is what you need. 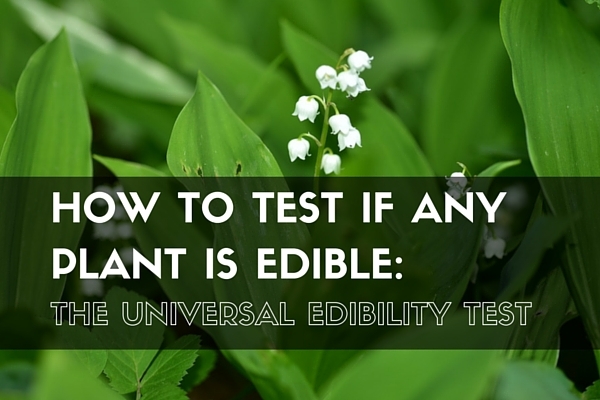 The universal edibility test can also sometimes lead you to believe edible plants are inedible. For instance, stinging nettles are edible when cooked, but cause a skin reaction. Another example is how acorns and water lily are both very bitter unless boiled, so the edibility test would falsely rule them out. Learning your local plants using a guide may be the easier route, but knowing the procedure to test a plant’s edibility is always good knowledge to have. Keep learning and stay safe. I love this. These steps are similar to those found in the SAS Survival Guide. I’ve not tried these myself, but they’re awesome to have around when needed. I use an edible plant guide, and usually stick to eating plants I’m familiar with. As you say in the article, however, we may not be afforded that luxury when in a survival situation. Thanks for sharing!